Pharmacovigilance is an evolving discipline in the Indian context. However, there is limited regulatory guidance for adverse event reporting outside the purview of clinical trials. There are number of deficiencies in the framework for adverse event reporting from the perspective of pharma industry, health-care professional and general public due to which adverse events for marketed drugs are highly underreported. This article discusses the need to strengthen national safety database by promoting and mandating reporting of adverse events by all the stakeholders. Clinical research is making toiling efforts for promotion and wellbeing of the health status of the people. There is a rapid increase in number and severity of diseases like cancer, hepatitis, HIV etc, resulting in high morbidity and mortality. Clinical research involves drug discovery and development whereas clinical trials are performed to establish safety and efficacy of drugs. Drug discovery is a long process starting with the target identification, validation and lead optimization. This is followed by the preclinical trials, intensive clinical trials and eventually post marketing vigilance for drug safety. Softwares and the bioinformatics tools play a great role not only in the drug discovery but also in drug development. It involves the use of informatics in the development of new knowledge pertaining to health and disease, data management during clinical trials and to use clinical data for secondary research. In addition, new technology likes molecular docking, molecular dynamics simulation, proteomics and quantitative structure activity relationship in clinical research results in faster and easier drug discovery process. During the preclinical trials, the software is used for randomization to remove bias and to plan study design. In clinical trials software like electronic data capture, Remote data capture and electronic case report form (eCRF) is used to store the data. eClinical, Oracle clinical are software used for clinical data management and for statistical analysis of the data. After the drug is marketed the safety of a drug could be monitored by drug safety software like Oracle Argus or ARISg. Therefore, softwares are used from the very early stages of drug designing, to drug development, clinical trials and during pharmacovigilance. 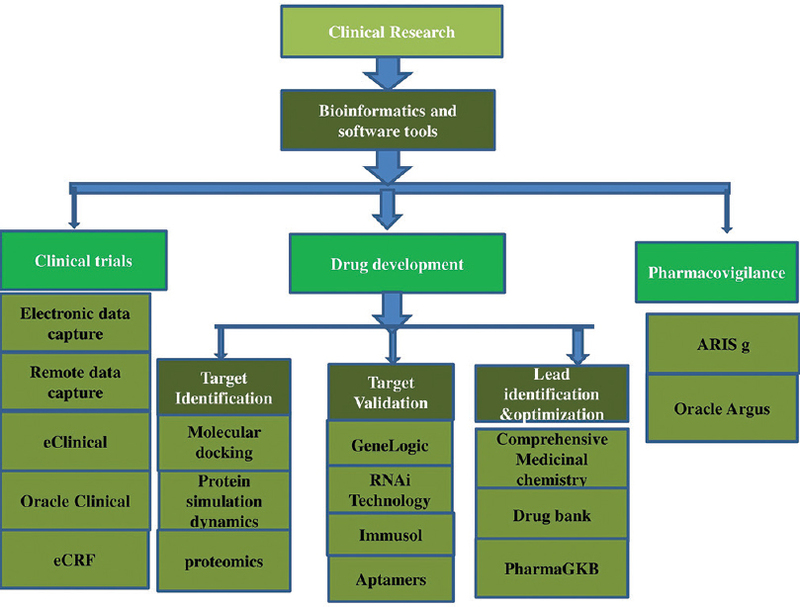 This review describes different aspects related to application of computers and bioinformatics in drug designing, discovery and development, formulation designing and clinical research. 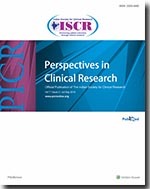 Background: Expansion of clinical trials activity into emerging regions has raised concerns regarding participant rights and research ethics. 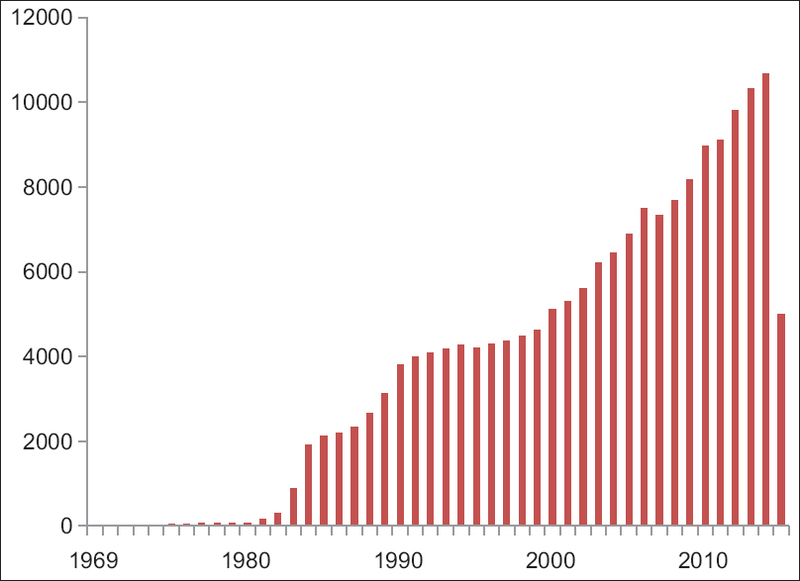 Increasing numbers of observational studies are now conducted in developing economies, including the United Arab Emirates. Materials and Methods: This study compares the content of information provided, Good Clinical Practice (GCP) guideline compliance, and readability of informed consent forms (ICFs) for observational compared to interventional studies. Results: GCP compliance for observational studies averaged at 79.5% + 6.8%, significantly (P < 0.001) lower than 92.2 + 5.0 percent for interventional studies. Readability ease and readability-grade level were assessed with Flesch-Kincaid scales. Results indicated higher readability grade-level 12.4 + 0.4 (P < 0.001) and lower readability Flesch-Kincaid reading ease score 35.7 + 3.6 for observational studies, as compared to 10.3 + 1.6 and 47.8 + 7.4 for interventional studies. Conclusion: Mandatory training for investigators is essential to provide readability ease and GCP compliance for the ICFs for the local population. Background: The Consolidated Standards of Reporting Trials (CONSORT) statement is a device to standardize reporting and improve the quality of controlled trials. However, little attention is paid to the statistical components in the CONSORT checklist. The present study evaluates the randomized controlled trials [RCTs] published in five high impact pharmacology journals with respect to its statistical methods. Methods: Randomized Controlled Trials [RCTs] published in the years 2013 & 2014 in five pharmacology journals with high impact factor, The Journal of Clinical Pharmacology (JCP), British Journal of Clinical Pharmacology (BJCP), European Journal of Clinical Pharmacology (EJCP), Journal of Pharmacology & Pharmacotherapeutics (JPP) and Indian Journal of Pharmacology (IJP) were assessed for adherence to the statistical components of CONSORT statement. Results: Of the 174 RCTs analysed, 103 described the method of sample size calculation. Of the five journals, maximum reports in JCP (34/50) and minimum in IJP (13/31) adhered to the CONSORT checklist [item 7a-sample size calculation]. Most reports mentioned the statistical methods used for analysis of data. (171/174) as per the checklist [item 12=statistical methods used]. Analysis of variance (ANOVA) was the most commonly used test (88/174). The software used for statistical analysis was mentioned in 111 RCTs and SPSS was used more frequently (58/111). The exact p value was stated in 108 reports. Certain errors in statistical analysis were also noted (40/174). Conclusion: These findings show inconsistencies and non- adherence to the statistical components of the CONSORT statement especially with respect to sample size calculation. Special attention must be paid to the statistical accuracy of the reports. 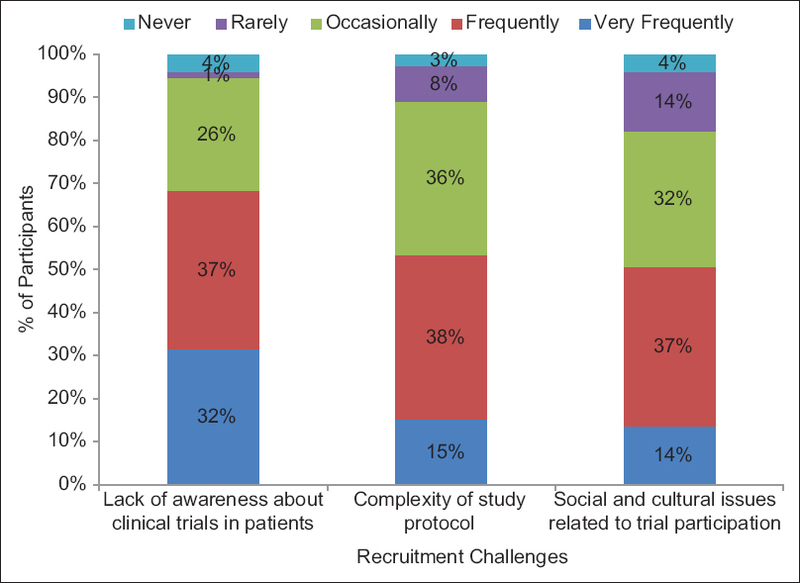 Introduction: Deviations from the approved trial protocol are common during clinical trials. They have been conventionally classified as deviations or violations, depending on their impact on the trial. Methods: A new method has been proposed by which deviations are classified in five grades from 1 to 5. A deviation of Grade 1 has no impact on the subjects' well-being or on the quality of data. At the maximum, a deviation Grade 5 leads to the death of the subject. This method of classification was applied to deviations noted in the center over the last 3 years. Results: It was observed that most deviations were of Grades 1 and 2, with fewer falling in Grades 3 and 4. There were no deviations that led to the death of the subject (Grade 5). Discussion: This method of classification would help trial managers decide on the action to be taken on the occurrence of deviations, which would be based on their impact.